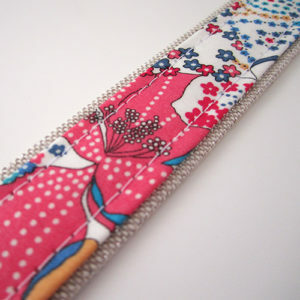 There are several ways to make a double-sided strap, this is my favorite, which reveals a small border on the right side (like the handles of the Cabotin bag). 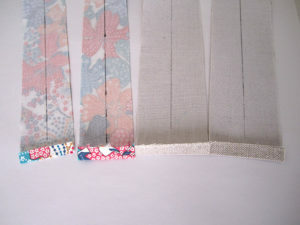 Cut 2 strips, one in each fabric. 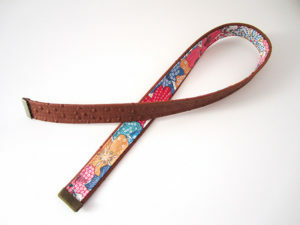 Width = 2 x desired width of the shoulder strap. 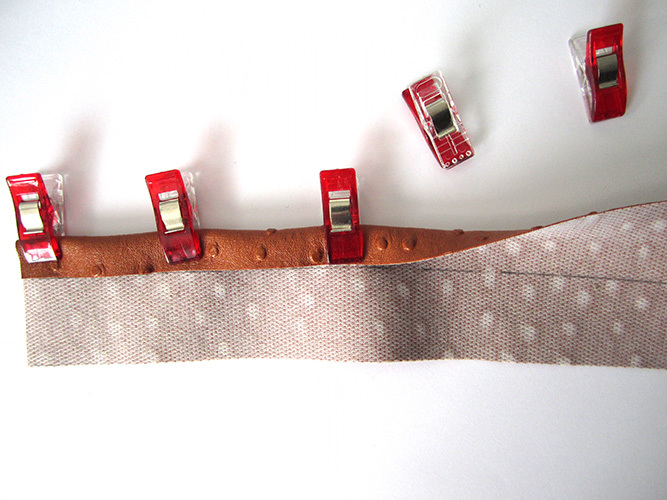 Example: for a finished 2.5 cm (1″) shoulder strap cut a 2.5 cm x 2 = 5 cm (1″ x 2 = 2″) wide strip. 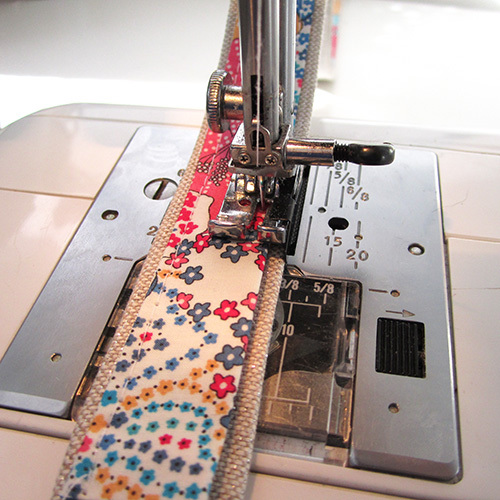 Length = 140 cm (55″) minimum for an adjustable shoulder strap (adjustable shoulder strap tutorial) – or 60 cm to 70 cm (24″ to 28″) for handles. Width = width of the bottom strip – 1 cm. 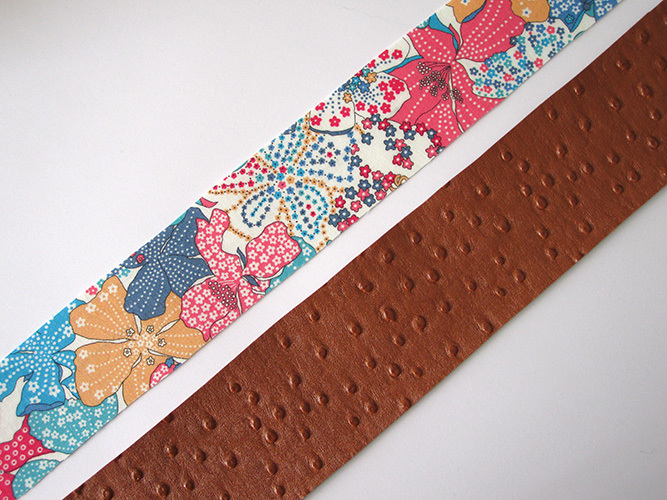 Example: for the example above where the bottom strip is 5 cm (2″) wide : 5 cm – 1 cm = 4 cm (2″- 3/8″ = 1 5/8″). Length = same as the bottom strip. 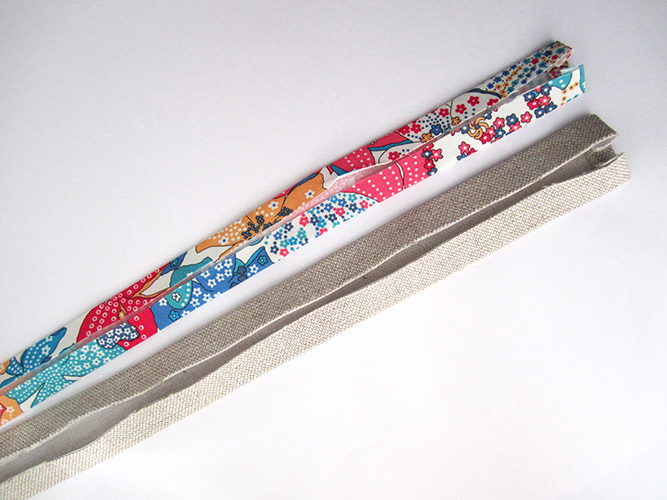 For a vinyl + cotton strap, cut the bottom (widest) strip in vinyl and the top strip in cotton. 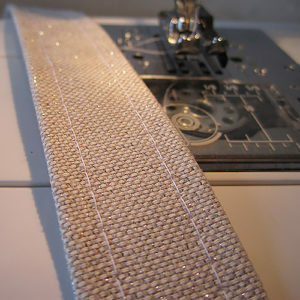 If you make a strap entirely in cotton, interface the two strips. 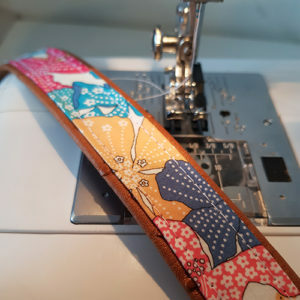 For a vinyl + cotton shoulder strap, the interfacing is only necessary if your vinyl and / or your cotton is light weight, in this case interface the cotton strip. 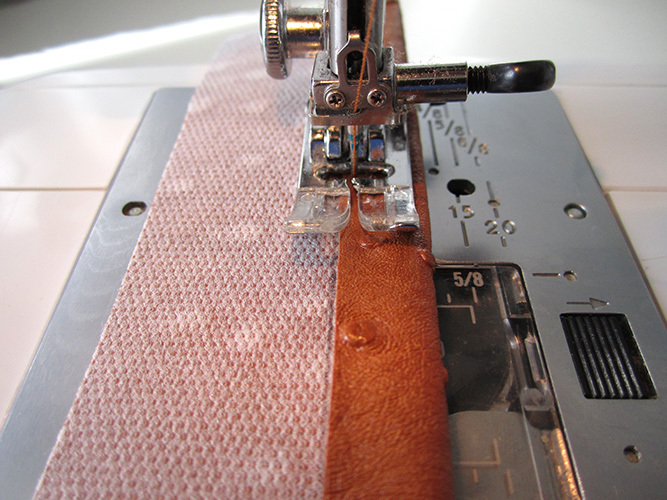 If you plan on stitching the handles or the shoulder strap into a seam of the bag, then you don’t need to finish the ends. 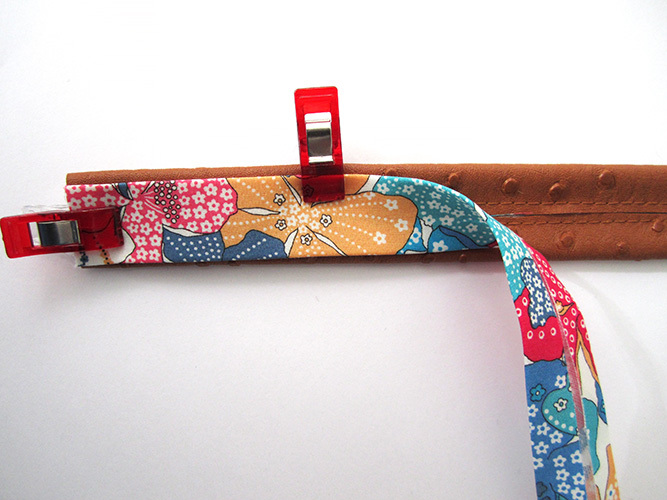 By using metal strap ends : in this case, the ends of the strap will simply be hidden, once the shoulder strap is finished, in the metal ends. By folding 1 cm (3/8″) to the wrong side at each end of the 2 strips. Technique 1 for a vinyl + cotton strap. Technique 2 when the 2 strips of fabric can be iron pressed – Example: 2 cotton strips. 1- Draw a line in the center of each strip (I use a Frixion erasable pen). These lines will serve as a guide for folding. 2- Take the vinyl strip (widest) and fold one of the long edges, wrong sides together, to align it with the center line. Hold with clips or Wonder Tape. 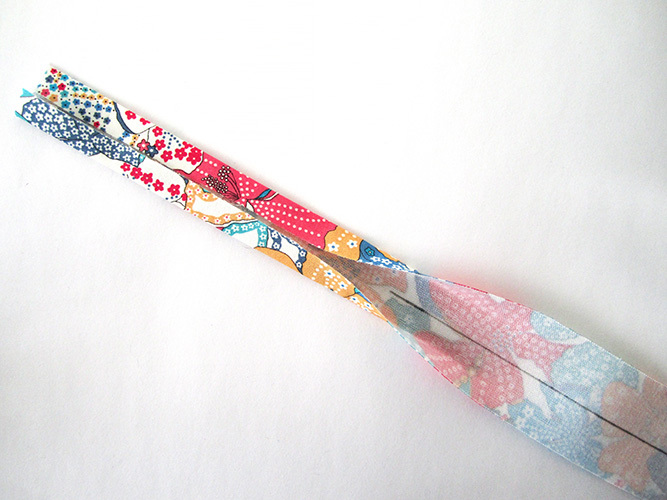 Fold a long edge and hold with clips. 3- Topstitch the folded edge with a 1 cm (3/8″) seam allowance (stitch length 3.5 to 4 mm). Topstitch the folded edge with a 1 cm (3/8″) seam allowance. 4- In the same way, fold the other long edge, wrong sides together, to align it with the center line and topstitch with a 1 cm (3/8″) seam allowance. 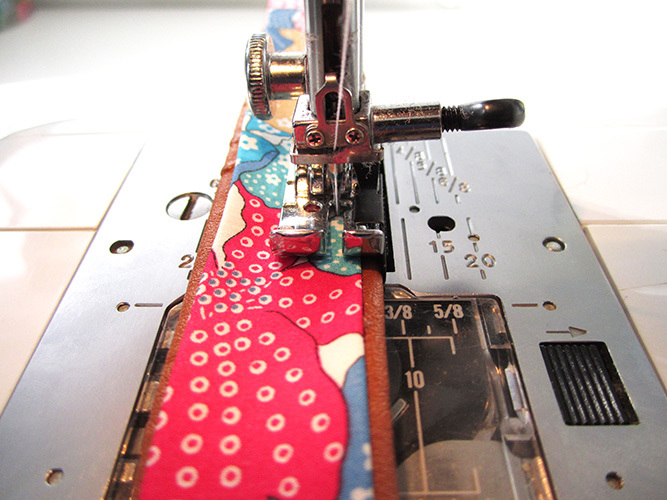 Fold the other long edge and topstitch with a 1 cm (3/8″) seam allowance. 5- Fold the long edges of the cotton strip, wrong sides together, toward the center line and press. Fold the long edges and press. 6- Center the cotton strip over the vinyl strip, wrong sides together. 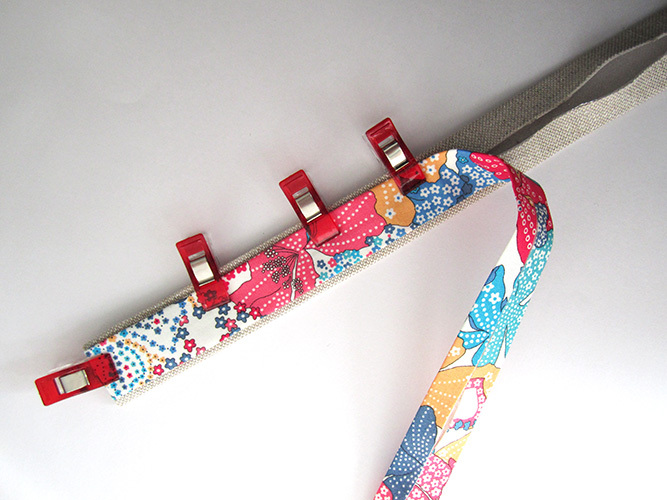 Hold with clips or Wonder Tape. Center the cotton strip over the vinyl strip, wrong sides together. 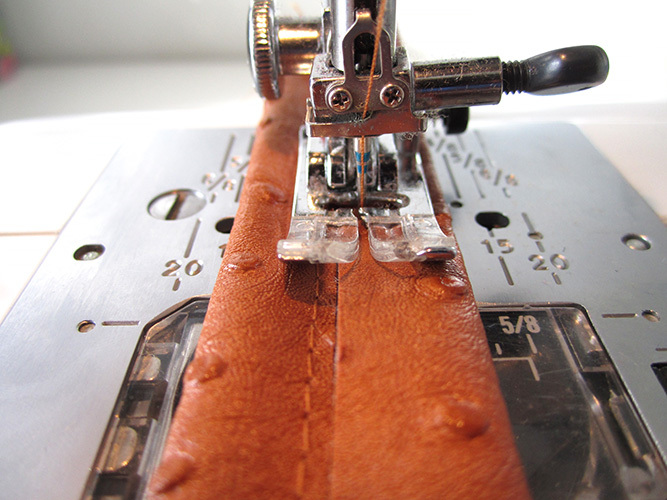 7- Topstitch on the cotton strip and through all layers with a 0.5 cm (1/4″) seam allowance. Be careful the 0.5 cm (1/4″) seam allowance is measured from the edge of the shoulder strap, not from the edge of the narrowest strip. 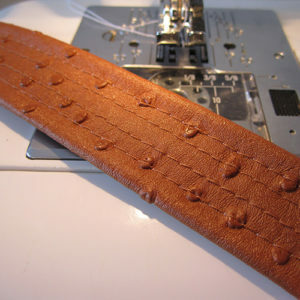 Same stitch length as the previous topstitching: 3.5 to 4 mm. 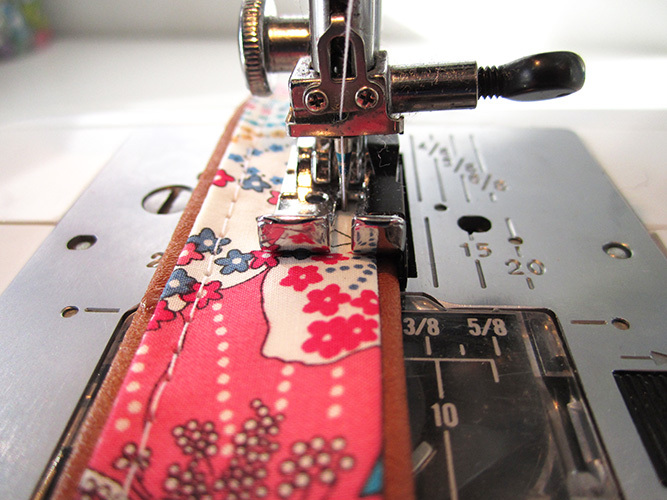 Topstitch on the cotton strip and through all layers with a 0.5 cm (1/4″) seam allowance. Voilà ! The vinyl-cotton strap is done : the contrasting strip is on the right side and 4 lines of parallel stitching appear on the vinyl side. 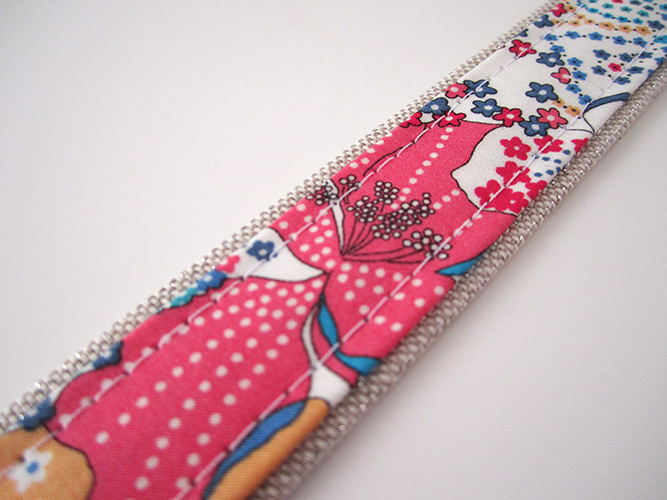 Double-sided strap done and metal ends installed. 1 –Draw a line in the center of each strip (I use a Frixion erasable pen). These lines will serve as a guide for folding. 2- Fold the long edges of the 2 strips, wrong sides together, toward the center line and press. Fold the long edges toward the center line and press. 3- Center the strips widthwise, wrong sides together. Center the strips widthwise, wrong sides together. 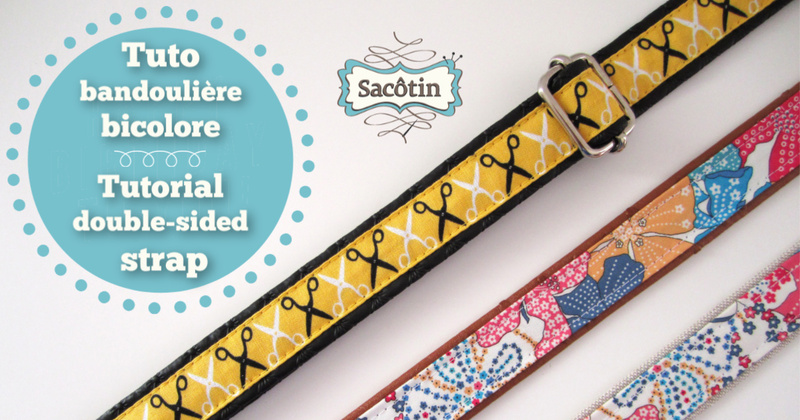 Topstitch on the top strip and through all layers with a 0.5 cm (1/4″) seam allowance.